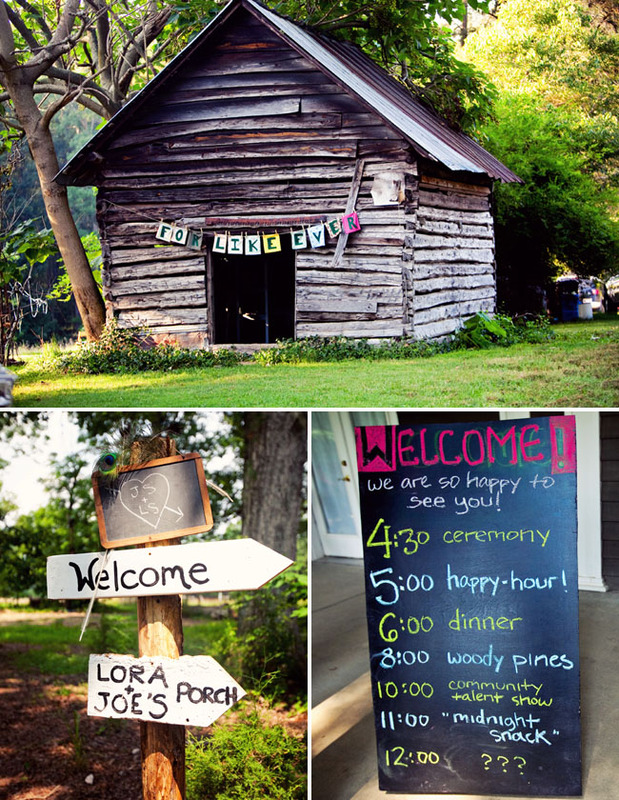 There are so many fun elements to this wedding! I love that Lora + Joe are both super committed to buying, eating and living locally – and this was featured in each + every aspect of their wedding. 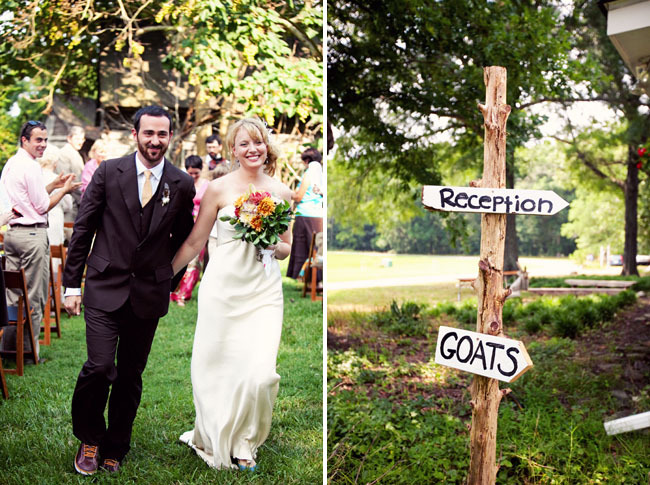 They actually live + work on the amazing goat farm where they got married – The Inn at Celebrity Dairy! All of their flowers were purchased at local farms and all their amazing food was also local. 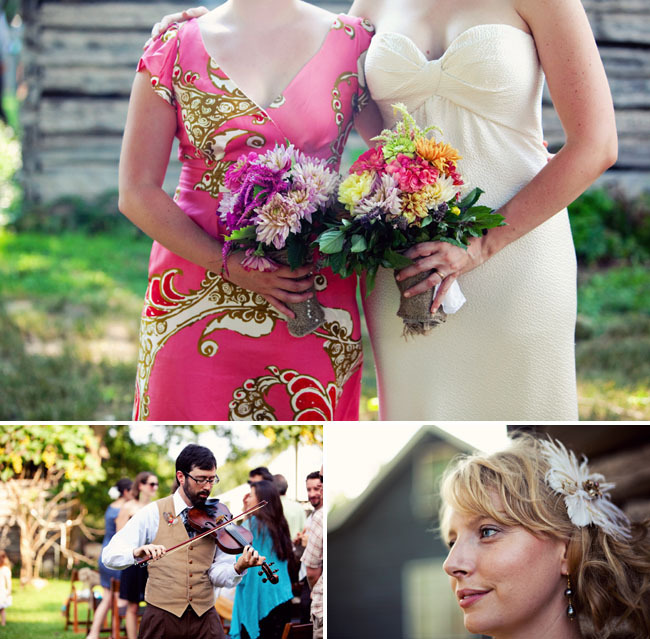 Lora’s dress was a vintage Oscar de la Renta that she purchased used online. Joe’s suit was custom-made through a tailor they found on Etsy (AJ Machete & Sons). 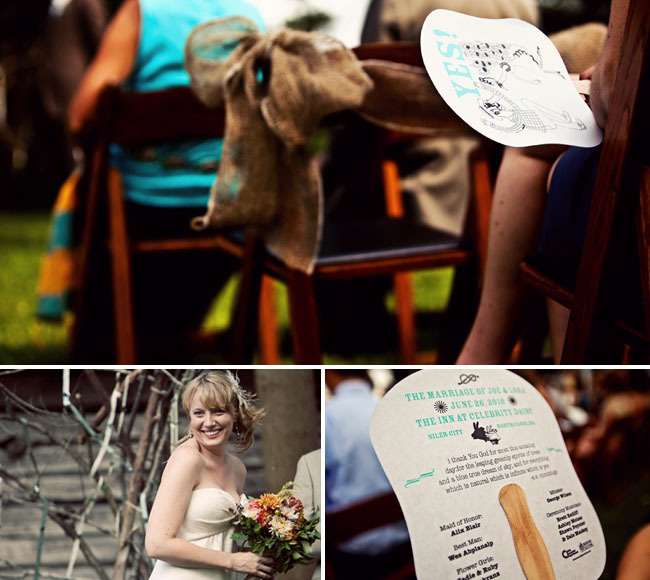 Joe’s sister designed the amazing invitations + programs herself. And there were lots of super cute word flags all over the ceremony + reception that were a surprise gift from a friend who also owns her own etsy shop. Most of the decorations were handmade or repurposed objects found on the farm and those that weren’t were found in local antique markets. Lora + Joe tried to use as many used and recycled things as they could and when they did buy new, they made sure to buy from independent artists. 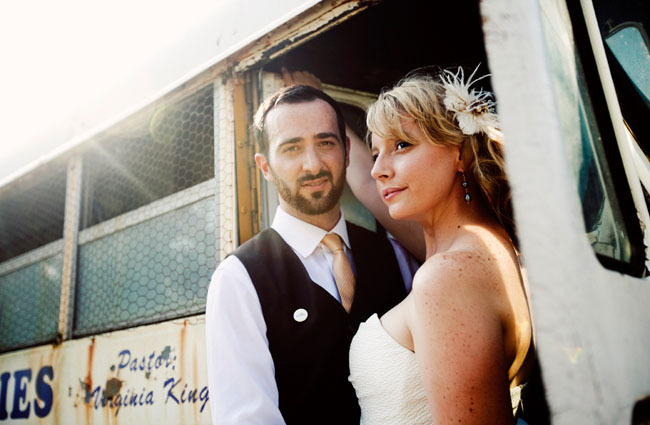 Thanks so much to (once like a spark) photography for sending this wedding my way! The wedding cake was an Apple Stack Cake with buttercream icing made by a local cake vendor who can does specialty baking and custom orders through the local farmers market. i LOVE all of the tiny details in this one. the handmade signs, the herb infused vodka, the MENU IS HEAVENLY! this one is adorable!! What a beautiful, fun wedding! LOVE IT! Oh! They had a talent show? We are planning to have a talent show the night before (we are getting married at a kids’ summer camp). I’d love to know more, if the bride or photographer or a guest happens to see this. Gorgeous! What a fun and unique wedding!! so sweet, I just adore all the details. And the goats are adorable! 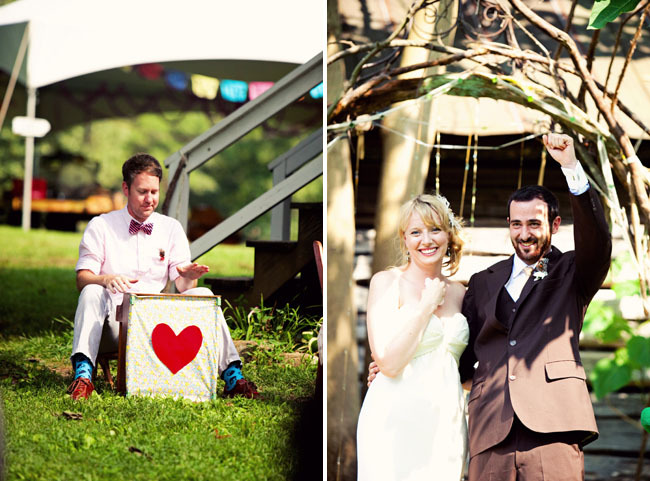 I am getting married in NC and am looking for a great live band! how did you get ahold of woody pines?! THey looks great, and this all looks so fun. Also, Sophie – free free to email us as well and we can give you the personal email address for Woody to get in touch with him. They were amazing! Thanks! This may be one of my favorite weddings EVER! We couldn’t have done it without all of our amazingly talented friends! Wow I am amazed by this wedding! Fantastic Job. This is one of the coolest weddings I have seen in a while. Congrats you two. man, how fun! 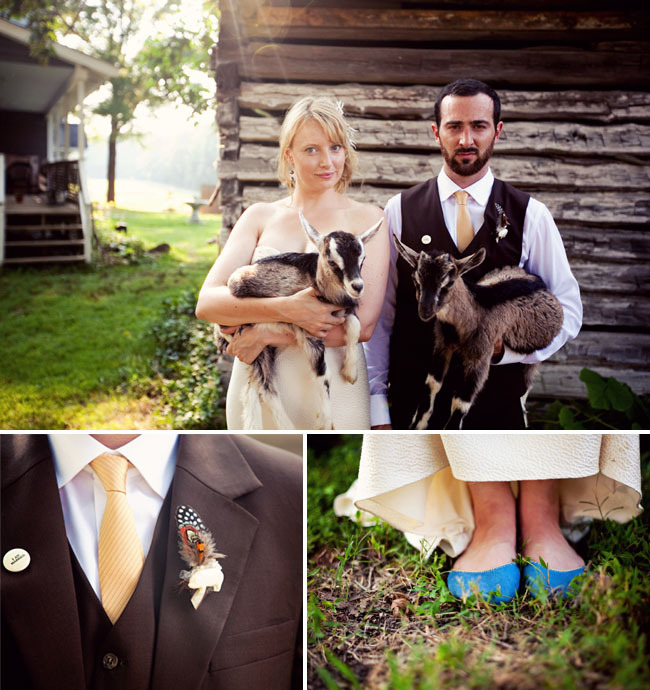 love and excitement pour out of this couple and into this wedding, and shamelessly i adore the details. 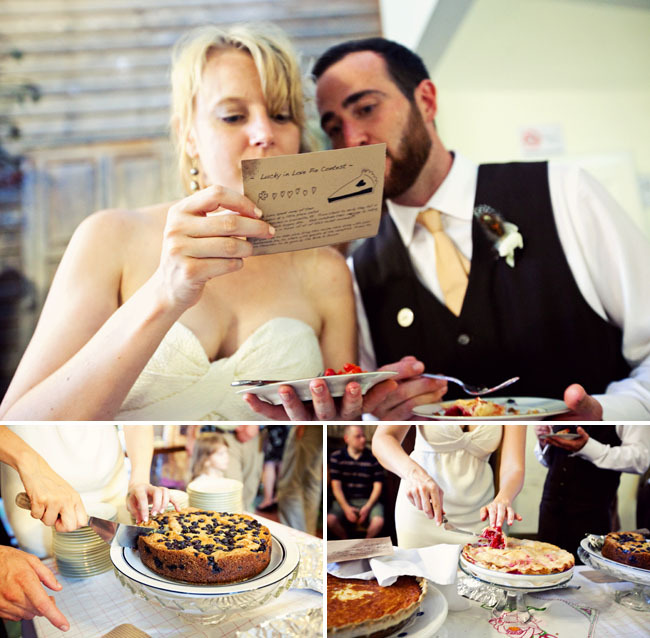 the quilt square bunting, the pie contest, and the wedding cake (it actually LOOKS like a cake).. and kudos to (once like a spark) photography – these photos have such a fresh feel to them! 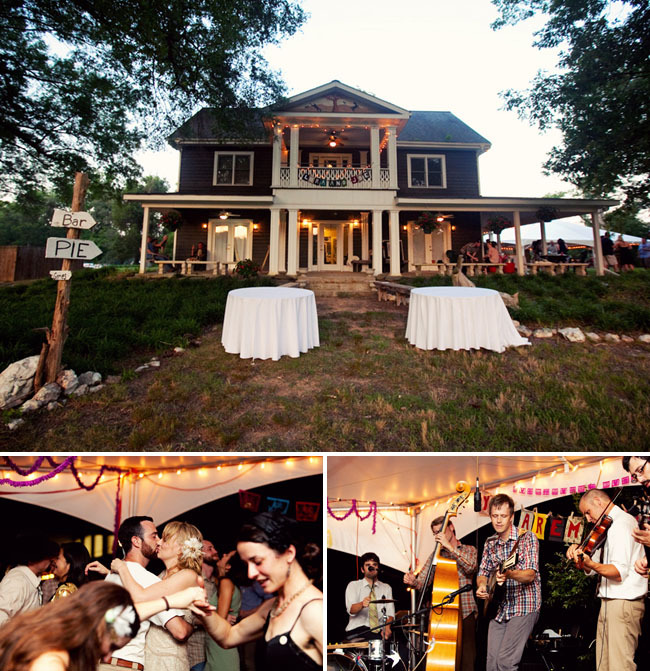 This is a great Post for what was the best wedding I’ve ever attended. There are so many things I love about this wedding. Let there be pie! love all the handmade details! oh my dear lord i’ve just found the perfect wedding! I am soooo liking all of the banners! I love that the phrases are quirky and unique…it’s so awesome to see a couple thinking outside of the box! 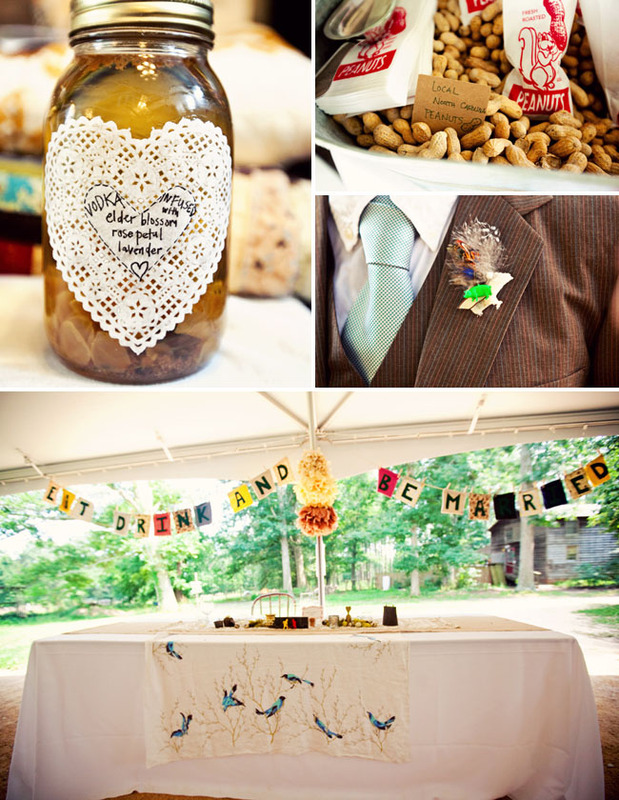 Totally adorable homespun wedding! A talent show sounds exciting and fun. 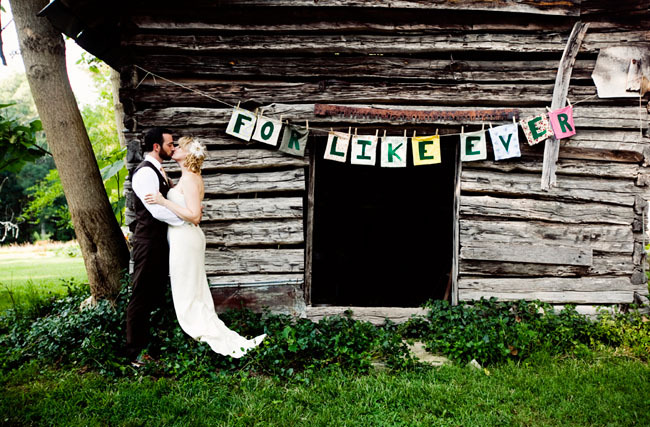 From that opening bunting sign “For Like Ever” I knew this would be one charming, fun, and original wedding! 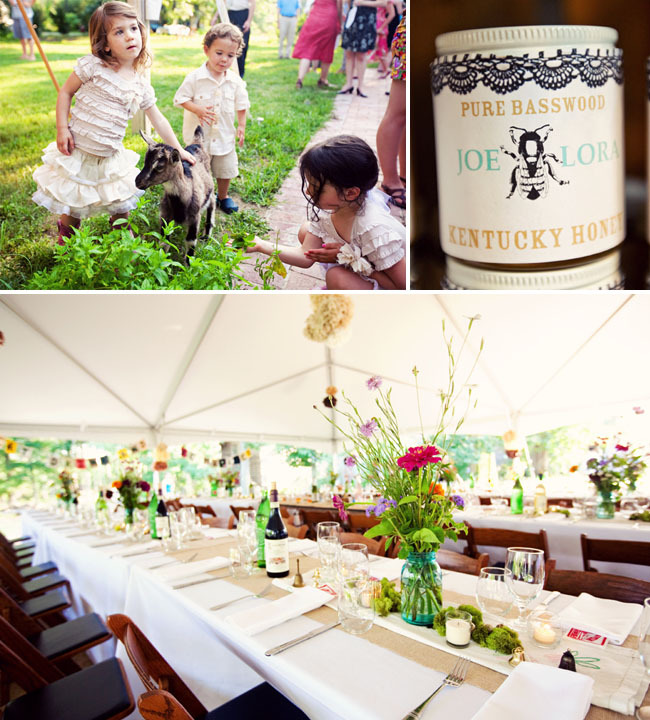 Love the tented reception set-up, so fresh and inviting. 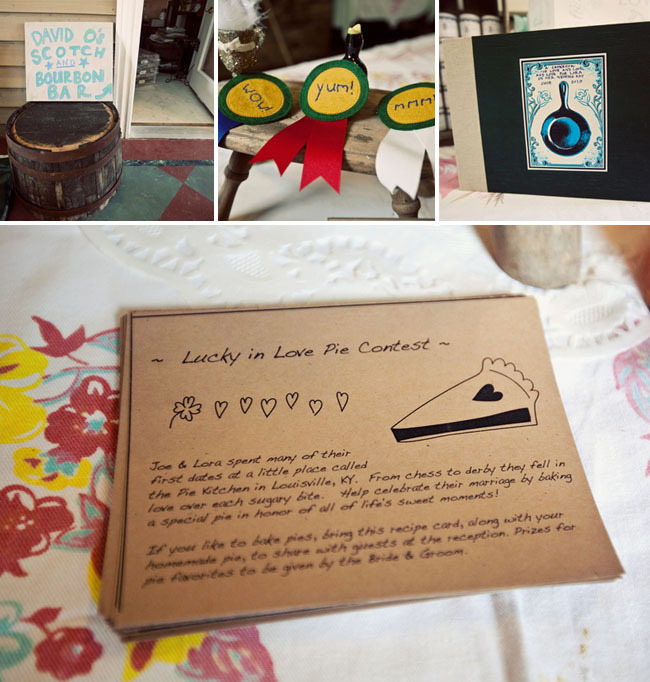 And the so sweet story-behind-the-pie! 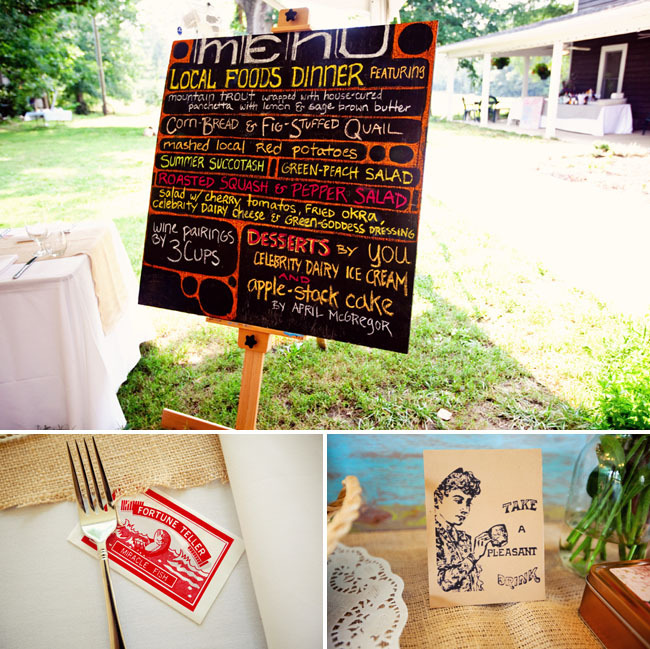 I adore all the fun details of this wedding! Fantastic photos and couple! Simply lovely! How fun is this wedding! Such personality! 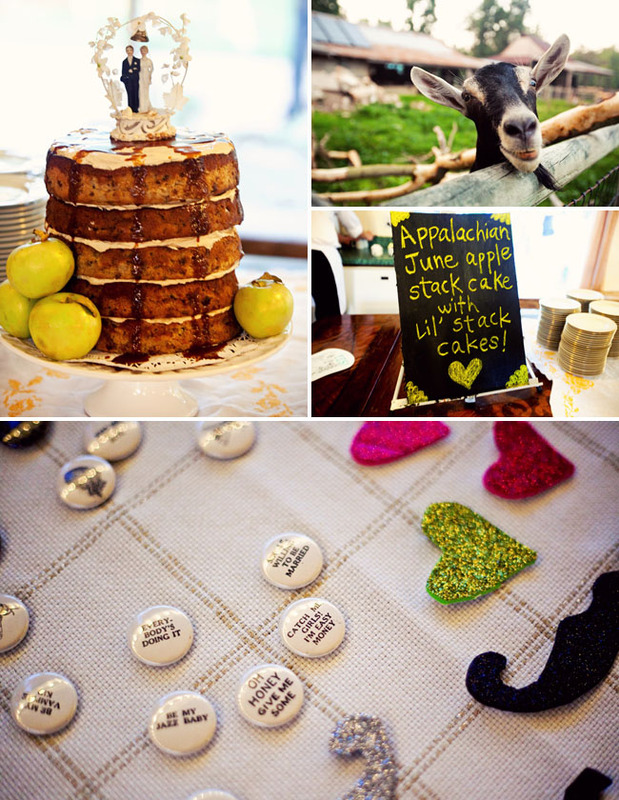 I absolutely love this wedding and all the thoughtful DIY details – and a goat farm – amazing! I love this wedding! Amazing photos and the baby goats are ssssoooo CUTE!! the cakes look so yummy….. The goat picture is hilarious! This wedding looks like so much fun! This is amazing!!! Especially love the cake and all of the homemade signs! The hairpiece is also stunning… thanks for sharing! I’ll admit, you had me at goat farm. 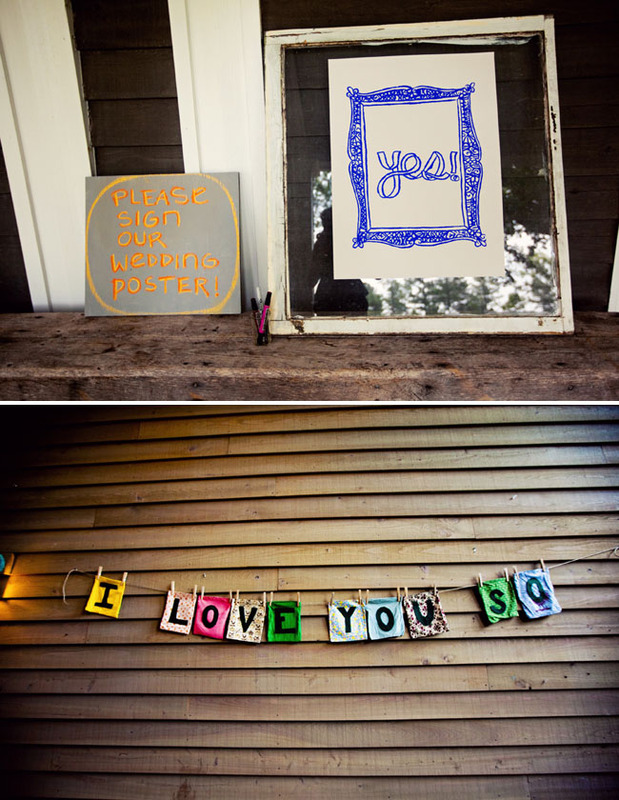 :) But all of the cute DIY details really draw me in, too! What a delightful day! Where did you get those amazing fan programs?